RGB indoor and outdoor lighting solutions vary greatly. Indoor fixtures are sensitive to corrosion and offers very little protection against exposure to wet elements. Outdoor lights that have been approved by various product safety organizations, such as Underwriters Laboratories (UL), are great options for exterior locations that experience harsh weather. Below highlights the difference between RGB outdoor and indoor lighting. RGB indoor lights do not typically carry heavy approval ratings. Most are designed with aesthetics as the main priority in order to match other tasteful components inside the facility. Because of this, the fixtures are not usually sealed tight, and protection against corrosion is minimal. However, this does not mean that one cannot find RGB indoor lights with UL ratings. Without taking aesthetics into consideration, exterior RGB lights can be used indoors. However, the opposite is not recommended; and using indoor fixtures outdoors can be dangerous. 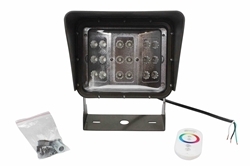 Outdoor RGB lights presents several advantages over indoor models, when used inside a building. Since such fixtures are sturdier, their lifespans can be extended indoors, where the environment is predictable and easily controlled. There are also plenty of reasons why one would want to use outdoor units indoors. RGB lights with waterproof ratings can be installed inside a bathroom with high humidity, or near a kitchen sink for extra lighting.